At MWC 2015, Lenovo presented a duo of A-series tablets, targeting a price range between $130 - $199 for the basic Wi-Fi models. The flagship product is the Lenovo TAB 2 A10, a 10-inch slate powered by 64-bit quad-core MediaTek silicon with 2GB of RAM. Its 10.1-inch IPS LCD screen runs on 1080p resolution, and its large 7200mAh battery is up for 10 hours of uninterrupted usage! All that from a tablet that's 8.9mm thick and weights 509 grams. This is also the first Android tablet to feature ATMOS cynema-style sound. The Lenovo TAB 2 A10 runs Android 4.4 KitKat, but it will be updated to Lollipop in June. It will debut in April, costing $199 for the base Wi-Fi model, and $279 for the base LTE model. 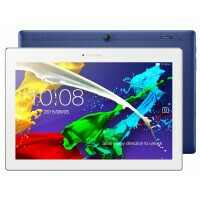 The tablet will be sold in Pearl White and Midnight Blue. Next up is the Lenovo TAB 2 A8, with an 8-inch 720p IPS display, a 64-bit quad-core MediaTek 8161 processor with 1GB of RAM, 16GB of expandable storage, and a battery life of up to 8 hours thanks to its 4200mAh unit. The tablet runs Android 5.0 out of the box. It's also a Dolby ATMOS 3D-supporting device that's 8.9mm thin, but weights under 360 grams. It has a dual-SIM model as well, enabling both GSM voice and 4G LTE data, so it can be your tablet AND smartphone if you like the idea. The TAB 2 A8 will be sold in June 2015, with Wi-Fi models starting from $129 and LTE models starting from $179. The color options are Pearl White, Ebony, Midnight Blue, and Neon Pink. BARCELONA ― March 1, 2015: As a leader in building devices for the uniquely personal ways people use technology today, Lenovo (HKSE: 992) (ADR: LNVGY) has created three new consumer tablet choices: a pair of A Series Android tablets, the Lenovo TAB 2 A8 and A10-70, and a Windows tablet, the ideapad MIIX 300. Debuting at Mobile World Congress 2015, these different devices help meet consumers’ desire for entertainment and portability at prices set for universal appeal. The all-new A Series proves affordable tablets can go big for entertainment capabilities with their high-speed LTE connectivity and Dolby Atmos technology. These tablets not only keep people connected virtually anywhere, but they also make movies, TV shows and music more enjoyable with astonishing clarity, richness, power and depth over their built-in speakers. Meanwhile, the 8-in ideapad MIIX 300 offers Windows users pocket-sized productivity. comes in two enticing color choices: Pearl White or Midnight Blue. And with pricing starting at less than $200 USD, Lenovo is reshaping the relationship between price and value. unexpected in an entry level tablet. Proving that good sound can indeed come in small packages, the TAB 2 A8 caters to media junkies with Dolby Atmos, a moving audio experience over headphones where sound seems to come from all directions, including overhead, putting users inside the action. Shutterbugswill also enjoy using the TAB 2 A8’s 5-megapixel rear camera to take sharp resolution photos. Responding to customer feedback and demand, we designed the TAB 2 A8 as our first tablet to run Android 5.0 Lollipop in pure form. Like its bigger brother, the TAB 2 A8 also features a MediaTek 64-bit Quad Core processor. It also features up to 32 GB of storage via a microSD card and comes in four distinctly fun color options: Pearl White, Ebony, Midnight Blue or Neon Pink. The Lenovo TAB 2 A10 will be available starting in April with models starting at approximately $199 USD for Wi-Fi models and $279 USD for LTE models. The Lenovo TAB 2 A8 will be available starting in June with models starting at approximately $129 USD for Wi-Fi models and $179 USD for LTE models. Consumers can find them at leading retailers and online at www.lenovo.com. How does the 8 inch model run on 5.0 when the 10 inch model runs 4.4? Wtf is Lenovo smoking?